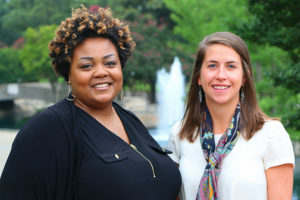 United Way of Central Carolinas announced today the addition of Kellie Cartwright and Adelaide Belk to the organization’s community impact team. The pair will jointly lead implementation of United Way’s recently launched community impact strategy focused on building stronger neighborhoods, improving the systems that serve children and families, and providing basic needs support across our region. Cartwright will focus on launching the organization’s United Neighborhoods initiative and continuing the Unite Charlotte efforts. She brings a wealth of experience to her role as Director of Community Impact, including having served as vice president of community impact at United Way of Greater High Point from 2011-15. Most recently, Cartwright was the grant writer for Rowan County. The United Neighborhoods strategy works to change the odds for individuals and families living in our region’s most under-resourced neighborhoods. Beginning later in 2017, United Way will work alongside residents and with business and community leaders in each selected neighborhood to drive transformation and revitalization efforts. Belk joins United Way as Director of Community Impact overseeing the annual Impact Grants funding process and partner agency relationships. She recently completed her MBA at Duke University after working previously with Change.Org, Refugees International, and Action For Children In Conflict. Through the Impact Grants process, United Way recently announced a $16.4 million community investment into health and human services programs across our region that began on July 1. Those funds were in addition to the $481,517 in Unite Charlotte grants released earlier this year for local nonprofits and neighborhood organizations. The Impact Grants provided funding to 78 agencies and 148 programs across Charlotte-Mecklenburg, Anson County, Cabarrus County, Union County and Mooresville/Lake Norman.